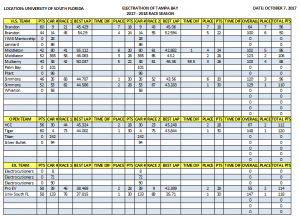 The race at the University of South Florida was a question mark up till the day before. With the weather forcast changing daily and hourly and the tropical storm heading into the gulf what were we going to do. Turns out the weather was great but we did start early. Light winds and sunny. 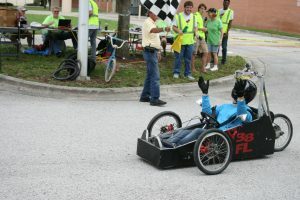 Out next race at Middleton High School should not have the uncertain weather conditions. 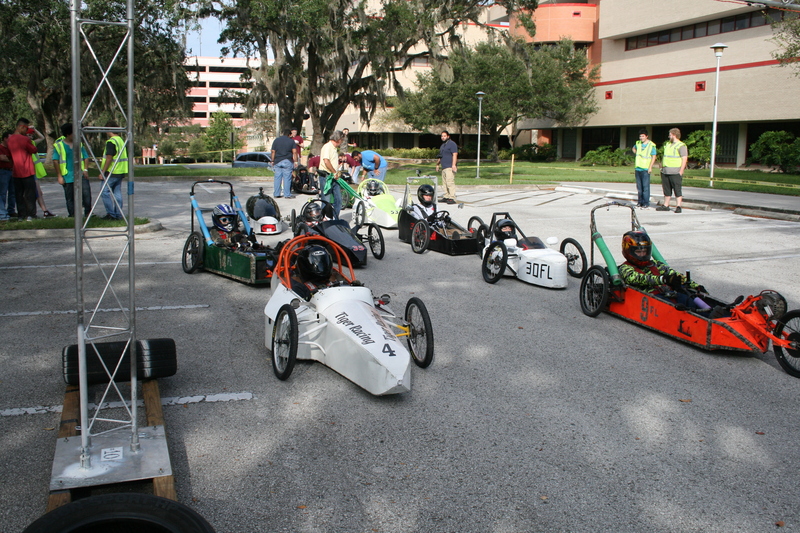 The new course at USF was a real challenge and hard on tires, wheels and drivers. There were multiple blown tires and this week the Brandon 9 car drove the wheels off of the car when a wheel bearing froze up and locked the rear wheel. The 9 car took both races last time out but the wheel problems dropped it way down the standings this time out. The Middleton 365 car kept its wheels on this time out and finished second on the day. The 365 car had a wheel come apart last time out. The new kids in town, Mulberry and Simmons, both had good days. Mulberry took a 3rd in the second race and Simmons took the top spot for the day in the High School Class. Plant High had their new car out for the first time. They ran some practice laps for a shakedown run. 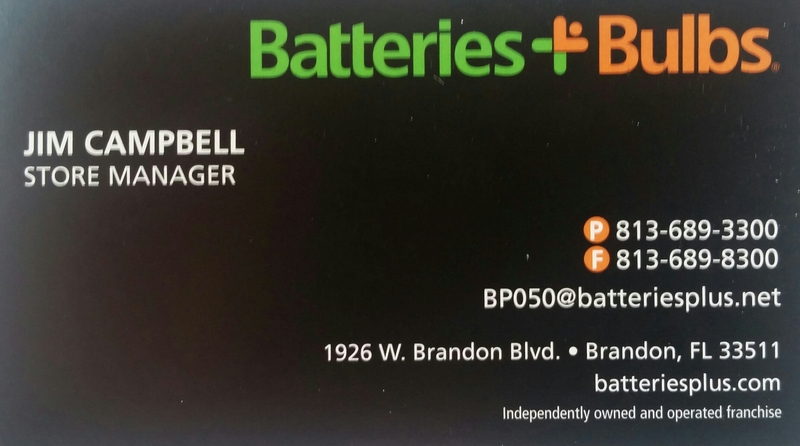 They have some inspection items to correct and they will be ready to go. Hope to see them on the track next month at Middleton. In the Open Class it was Rodney in the 4 car taking both races. HCC had multiple problems over the course of two races including when they wound up spinning out late in the second race. In the Exp. Battery class it was the home team, USF running away from the field in both races. The new course had more turns and less straightaways which lead to more wear and tear on the cars. The roughness of the track surface didn’t help either. We made a suggestion to the USF team to put in a work order to have the parking lot repaved. They said Yeah, Right we will get right on that. 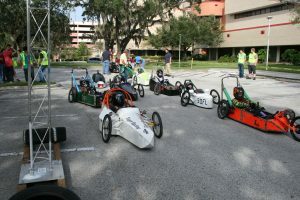 In Feb. we will be back on the regular track layout for the Engineering Expo at USF. Observations from the pits: Still having problems with mirrors. Ground clearance is 1.5″ min. We will start failing cars for these problems.